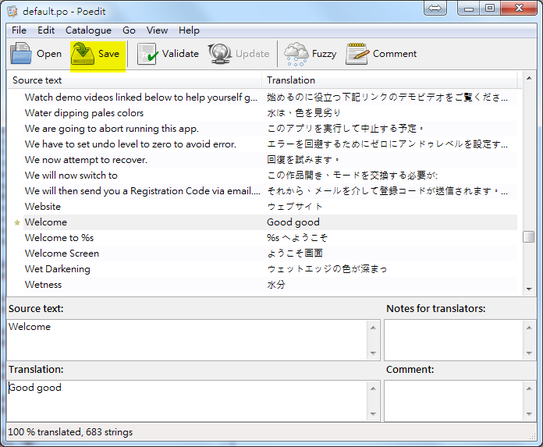 If you'd like to volunteer for translating the user interface of Expresii into your language, please download this .po translation file (Japanese, acting as a sample) and this .htm Hotkey list file (English), edit them and send us back. The .po file is just a plan text file that you can edit with any text editor, but you probably want to use one of the dedicated .PO editors like POEdit so that you can generate a .mo file (in POedit, just press the Save icon and both .po and .mo files are saved) to test out your text. You do so by replacing the 'default.mo' file in say the Japanese translation folders of Expresii, which looks like this: C:\Program Files (x86)\Expresii\Locale\ja\ LC_MESSAGES. You will still choose Japanese in Expresii to see your changes. For the hotkey list file, it's standard HTML file that you can edit with any HTML editor. ​ Why this page exists? One day we got an email from Daniel Siron volunteering for translating our UI to French (citing he also did it for other programs). We accepted the offer and he also accepted our offer for free Expresii license for thanking him saying he actually prefers the barter system in such situation. Some of the Texts not translated? Those texts in drop-down combo-box​es are not currently translated due to some technical issue. Also, the on-screen icon hints are not translated yet. But of course you're welcome to send us those translations in a separate note so that we can incorporate them when we get the technical issues ironed out. We already have Japanese & Chinese translations.